Use an electric mixer to combine all ingredients for the dressing until smooth. Keep refrigerated until ready to serve. Rinse and drain head of iceberg lettuce. Slice head of lettuce into quarters. Place lettuce quarters on serving plates. 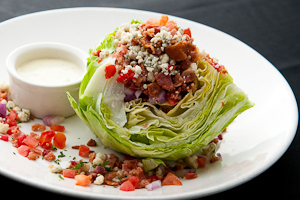 Add approximately 1/4 cup of bleu cheese dressing over each lettuce wedge. Sprinkle 1 tablespoon bacon, followed by 1 tablespoon chopped hard cooked egg and finally top with 1/4 cup diced tomatoes.